Walmart has a new promotion! 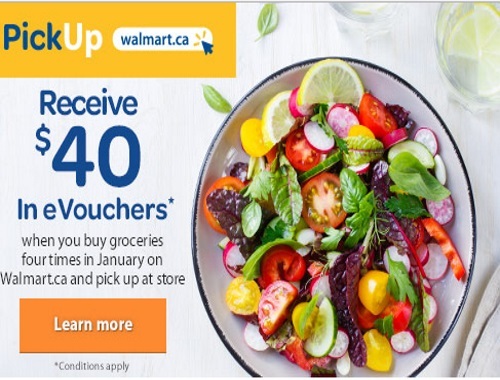 Receive $50 in eVouchers when you use Walmart PickUp four times in January. Shop for groceries online, then pick them up in store! You need to have a registered Walmart account to receive the eVouchers. Basket value minimum is $50 for each PickUp order. Walmart PickUp fee and/or shipping fees may be charged where they’re applicable. Customers receives two $20 eVouchers in their Walmart.ca account on or before February 7, 2017. eVoucher is one-time use only. eVouchers expire April 30, 2017.